Above, a participant in Saturday’s fun run in honor of former Artesia High School cross country athlete and coach Marcos Morillon, hosted by the Bulldogs and Lady Bulldogs at Jaycee Park, pays tribute to the well-loved and respected mentor to many with “One Last Run” painted on his chest. 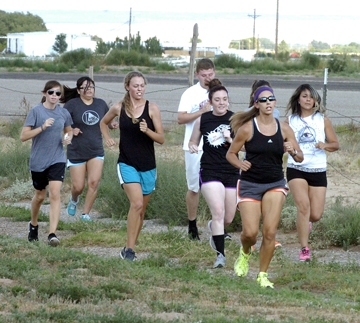 Below, runners make their way along the AHS cross country course. Morillon, who passed away Aug. 23, was laid to rest Aug. 29.